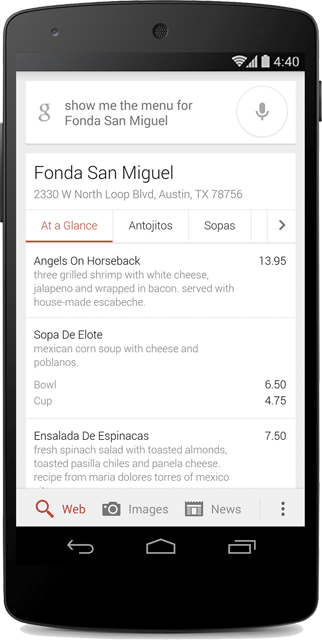 Late Friday, Google announced on Google+ that they now show restaurant menus in the search results. This is something we noticed a few weeks ago and now Google has confirmed this is indeed officially out there. Just search Google to show you the menu for the eatery you’re considering and you can see it right on the top of your search page - complete with tabs for different parts of the menu (like appetizers, brunch or dinner) and, often, prices - before you make your reservation. Menus are available in the U.S. only for now. I am a bit surprised they made no mention of how webmasters can help Google get their menus. No type of data feed or rich snippet details. Google may simply (well, it isn't so simple) crawl the site and parse out the menus automatically. Or maybe some restaurants have a special deal with Google?